The book's bright computer-generated illustrations were a creation of Deborah Koolen who is based in Melbourne. Deborah has worked in graphic art, design and illustration for the past 12 years, and now specializes as a freelance illustrator. 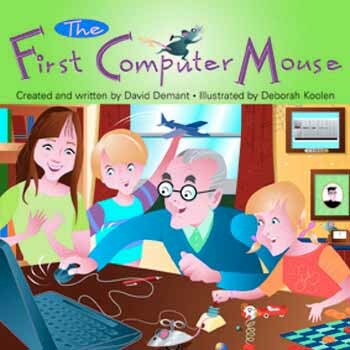 A fanciful children's story about the early days of computing when machines were huge and people fed them with paper tapes to tell them what to do, The First Computer Mouse tells the tale of a computing pioneer and his brush with a real live mouse who enjoys living under the warm belly of the first computer. Demant combines the history of early computing with an entertaining human/animal twist. Grandad explains the history of the first days of Australian computing to his grandkids and describes the colony of mice that coexisted with the computer scientists and the computer. "Why didn't you get a cat to catch the mice?" asked Anna. "Oh, because we were not allowed to have any animals near the computer." Demant manages to humanize this aspect of computer literacy with his amusing story telling while the vivid illustrations bring the story to life in a way that an elementary teacher could hold up the book for all to see and enjoy. "Grandad, if that was the first computer, you must have known the very first computer mouse." Copyright Policy: Materials published in From Now On may be duplicated and/or transmitted via e-mail and hard copy only if format and content are unchanged, and are for educational, nonprofit school district and university use only. This copyright statement must be included. All other uses, transmissions and duplications are prohibited unless permission is granted expressly. Showing these pages remotely through frames is not permitted. FNO is applying for formal copyright registration.